When you go on a vacation, leaving a light on in the home can be a good way to keep unwanted visitors out. Making sure a light is left on before leaving your house oftentimes gives a sense of comfort when returning. Having lamp timers can provide you with this comfort as well as help you save energy. Instead of keeping a light on when you are leaving the house, you can set the timer to turn a light on or off at a specific time of the day. Among the most efficient of these tools is the Intermatic Plug-In Lamp Timer. 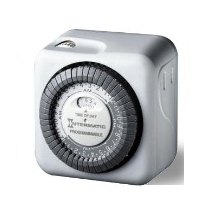 These plug in Intermatic timers fit right in to 2-prong outlets, which are common in most areas of the home, and they provide up to 24 on/off options per day. It can be used for turning lights as well as appliances on and off. Upon pulling out a tripper, the targeted appliance or lamp will be turned on for a 30-minute time frame, shutting off when the tripper is pushed in. This device has an amperage capacity of 15amps, wattage capacity of 1,750 watts, and power specifications of 125 Volts AC and 60 Hz. This lamp timer is easy to use and will help you light up your home the way you want.